Pilates is an exercise system accessible to everybody regardless of age or fitness level, including those recovering from injury. The movements are designed to stretch and strengthen the whole body, improving posture, balance, flexibility and mobility. It was developed by German-born Joseph Pilates around a hundred years ago and influenced by yoga, martial arts and Western forms of exercise. The low impact nature of the movements and the emphasis on muscle lengthening leads to increased strength and leaner muscles. At Studio Yoga mat based Pilates is taught in small classes allowing the teacher to focus on giving students individual attention. Our teachers have trained with Body Control Pilates. Class sizes are limited to a maximum of 12. Private instruction is also available by appointment. 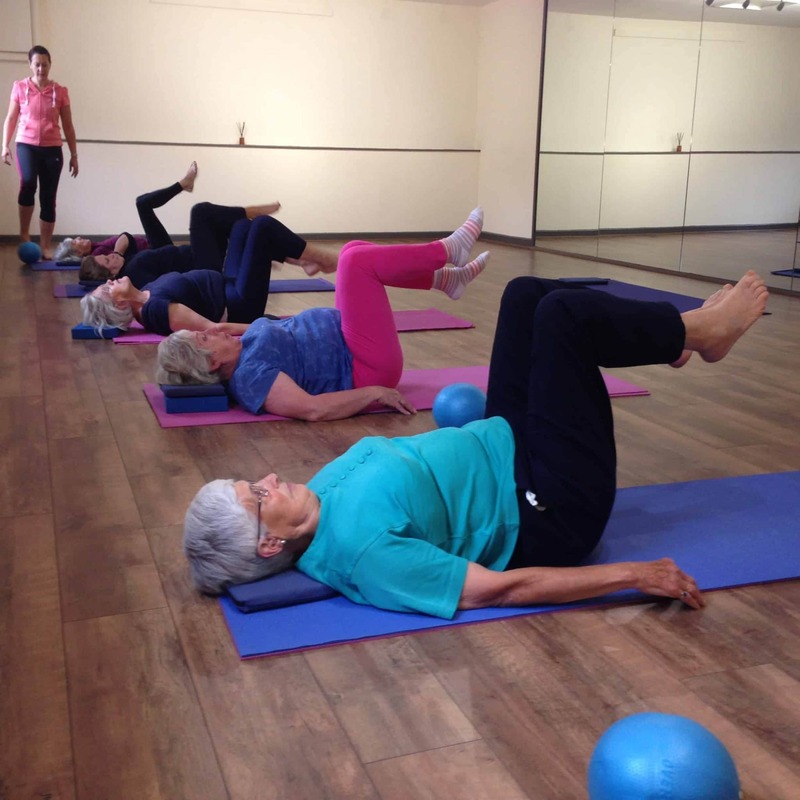 Pilates classes are taught in ability groups: Beginners, Improvers and Intermediates. 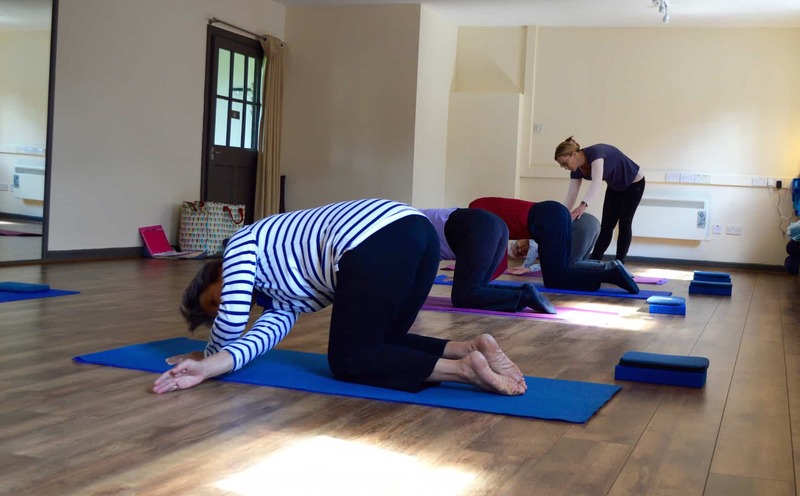 Beginners sessions break down the exercises into more manageable parts and teach the basic principles of breathing, concentration, relaxation, alignment and centring. For Improvers, the focus changes more to coordination, flowing movements and stamina. These classes may include work with a Swiss Ball and other equipment to improve strength and fitness. Intermediate sessions are for more experienced students putting everything together to truly challenge your core. 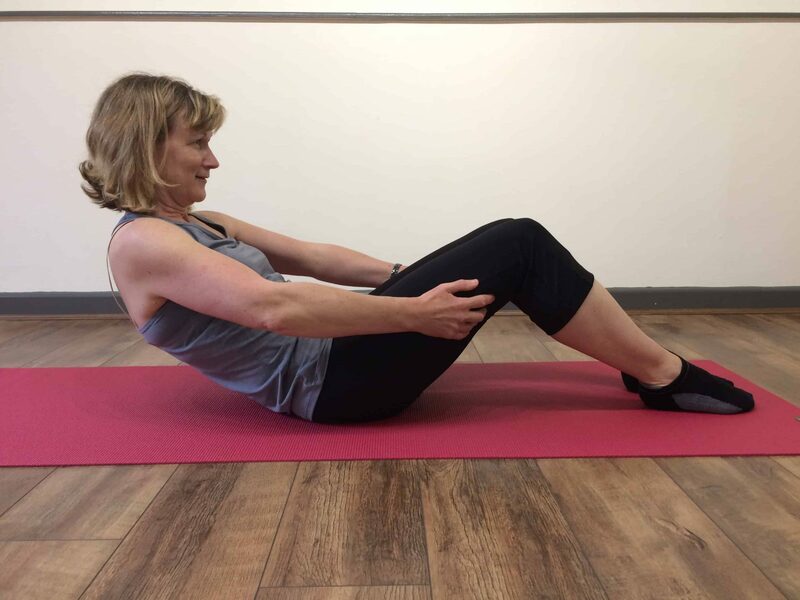 A short beginners course is the best way to begin your practice if you have never done Pilates before. At Studio Yoga you can earn the basics such as correct alignment and body awareness with an experienced teacher in a supporting and inspiring environment. The class size is limited to ensure each student received plenty of individual attention. Our next beginners course starts on Tuesday January 22 with Jill Hanna. Our experience is that people who start this way get more benefit from their classes and make faster progress. Another option, available at any time, is to have a 1:1 session. These can be arranged to suit and shared with a friend. 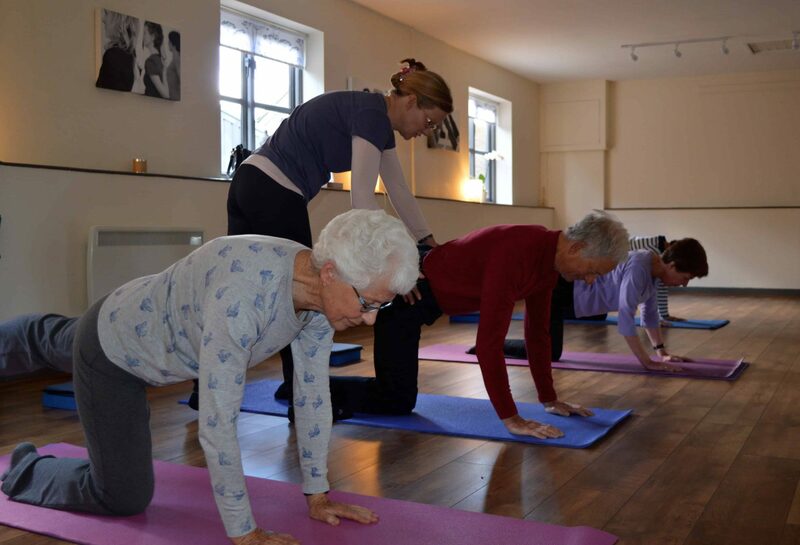 Pilates is suitable for all ages and these gentle sessions are designed to help the over 70s stay fit and reduce the risk of injury. The exercises focus on controlled breathing and the quality of movement, not the quantity of repetitions. Pilates also helps with a variety of age-related ailments. Arthritis sufferers benefit because the gentle mid-range movements decrease the chance of joints compressing while maintaining the range of motion around them. Thank you for a couple of very good years of yoga. I had no experience of yoga before coming to you and you've been a super teacher. I now incorporate yoga into many daily activities - from walking the dogs, working at my to desk, to emptying the washing machine...Your studio is a serene and friendly place, and I've appreciated your immense professionalism and commitment. The Yoga for Healthy Lower Backs course has really helped my shoulders and flexibility. I like creating space for me and the calm it gives - thank you. It is a necessary pleasure for me to kick-start my week at Studio Yoga. The Monday morning class sets me up for the week ahead. Tamsin is a dedicated teacher. Her classes are varied, her instructions clear and she always has an eye on her pupils individual physical requirements making adjustments that enhance their practice. I highly recommend Studio Yoga. After 6 years, I still look forward to my weekly yoga session. It sets me up for anything that the week can throw at me. Coming to yoga with Tamsin is like going on a mini-holiday every week. Tamsin is a great tutor, who creates an environment for her students that fosters the spirit of giving everything a go in a safe way. I wholeheartedly recommend Studio Yoga to anyone wanting to increase their flexible and sense of general well-being. The classes are friendly and small and are made up of all ages, sizes and genders. Each session builds on the last; creating a sense of achievement for the student each week. Please could you let Anneli know how brilliant I think she is as a Pilates teacher. What she does with me is really helping reduce any pain and is increasing my strength and flexibility. Thank you. Studio Yoga offers the unique opportunity to attend regular classes in a range of Yoga styles in a tranquil dedicated space. I am particularly pleased to be able to attend workshops led by a resident or visiting teachers offering a more in-depth exploration of Yoga. I would highly recommend the Yoga for Healthy Lower Backs course to anyone who suffers with back pain. It certainly has been the most beneficial form of treatment for me and has helped me recover from the most agonising painful back period I've ever had. That now seems to be a distant memory. I am genuinely thrilled I came to Yoga for Healthy Lower Backs. I, like many many others have suffered years of lower back problems, not helped by being a livestock farmer. Last year I had a prolapsed disc. When it eventually eased I went on the yoga for lower backs course. It has been hugely beneficial, not only for building physical strength, but also because it gave me the framework for better and quicker recovery when flareups have reoccurred and the mental strength knowing there is a way forward when things go wrong. The course shows an effective and doable way to really reduce back problems. As long as you do your exercises! Since starting Tamsin’s hatha yoga classes a year ago, I have noticed a marked improvement in my balance, core strength and flexibility. Tamsin makes all ages and abilities feel relaxed and welcome and her enthusiasm, warmth and encouragement have created a positive and enjoyable environment in which to practice and learn. I always look forward to my classes and leave feeling calmer, stronger and happier. Thank you. pleased to be able to attend workshops led by a resident or visiting teachers offering a more in-depth exploration of Yoga. The Yoga for Healthy Lower Backs course has really helped my shoulders and flexibility. I like creating space for me and the calm it gives – thank you. Thank you for a couple of very good years of yoga. I had no experience of yoga before coming to you and you’ve been a super teacher. I now incorporate yoga into many daily activities – from walking the dogs, working at my to desk, to emptying the washing machine…Your studio is a serene and friendly place, and I’ve appreciated your immense professionalism and commitment. I would highly recommend the Yoga for Healthy Lower Backs course to anyone who suffers with back pain. It certainly has been the most beneficial form of treatment for me and has helped me recover from the most agonising painful back period I’ve ever had. That now seems to be a distant memory. I am genuinely thrilled I came to Yoga for Healthy Lower Backs.